"At college, I gained organisation skills and was therefore able to make sure that I always handed my university work in on time – this has been a huge factor in my success at university." 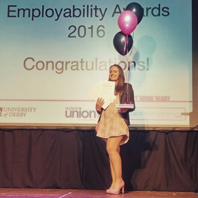 “My time at Derby College has helped me a lot with the tourism knowledge I need,” she said. “This knowledge can now be expanded into further useful areas such as marketing and human resources. Of course, making the transition from college to university life is still a challenge – Ewelina spoke to us about getting used to a different way of learning, a process which was made easier by the skills she learnt during her time at Derby College. Find out about studying Travel and Tourism at Derby College. To view Ewelina’s full case study click here.